The “356” watch collection is of the top of the line watches yet to be offered by Ferro & Company. Limited to 200 pcs (100 pcs single hand and 100 pcs double hand), the Swiss Made watches will come with a hand wound Swiss made ETA 6498 caliber movement with custom decorations and built with 43 mm polished high-grade stainless steel with a display back case showcasing the decorated movement. The watches will come with scratch resistant sapphire crystal with anti reflective coating as well as perforated racing style leather straps. Event though the watches are designed for drivers, they are water resistant to 50 meters. The unique design and craftsmanship of the “356” collection is synonymous with the iconic car. The dual layered complex dial resembles the tachometer while the polished case and bezel bear a resemblance of the chrome ring around the gauges. The 43 mm polished 316L Stainless Steel Case houses a Swiss Made custom decorated hand wound movement ETA 6498 which is manufactured by the world’s biggest and most reputable movement manufacturer ETA S.A. The in-house decorated movement can be seen via the glass back case. 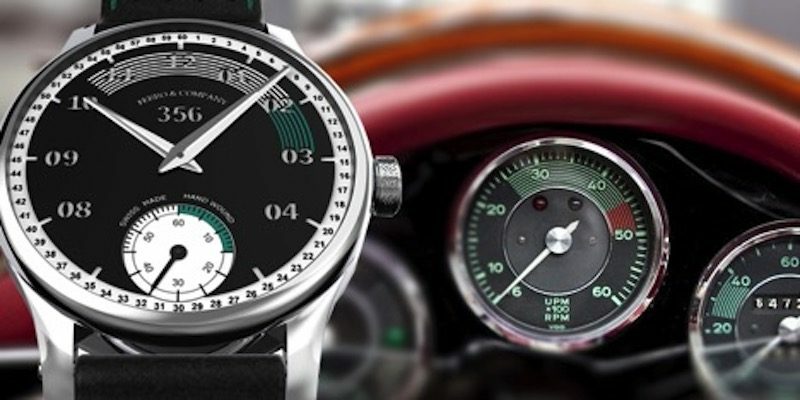 Recognizing FLATSIXES.com readers love and enthusiasm for vintage Porsches, Ferro & Company is offering this timepiece collection at its pre-sale event which will be offered starting $599. Future retail price will be $899 and up. Readers can choose the serial numbers and styles / colors available (single or double hand in silver, black, green or red case colors). To place your pre-order, please select your preferred serial number, and mention the desired colour in the comment box on “cart page”, or we will e mail you after you place your order to confirm the desired colour. The timepiece comes in a luxurious shiny black box including a 2 Year International Warranty.